Political scientists and party activists continue to sift through the demographic tea leaves left behind by the last election—the Democrats' white South problem, the Republicans' larger race problem, the growing generational divide. But the most striking gap between the parties is not the race or age or even income of voters. It's how close they live to each other. The map below follows up on the insights of Dave Troy, who finds a decisive break between Democratic and Republican support at a population density of about 800 persons/per square mile. 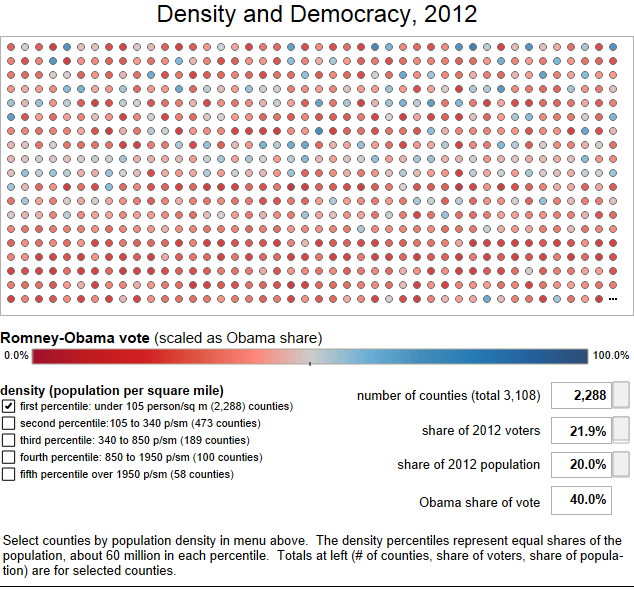 In less-densely populated counties, about two-thirds voted for Romney; in more-densely populated counties, about two-thirds voted for Obama. The distinction here is not between suburban conservatism and skyscraper liberalism: even most small cities and suburbs have thousands of persons per square mile (Cedar Rapids, Iowa, for example, has a population density of about 2400/sq mile). The 2012 results by county appear below (using the conventional red-blue color ramp). I've sorted the counties by density, and divided them into five groups (percentiles), each encompassing about one-fifth of the total population. The first percentile, for example, starts from the least-densely populated county and moves up the scale until we have enough counties to capture a fifth of the population. The number of counties in each group varies widely: the least-densely settled fifth live scattered across 2,288 counties; the most-densely settled fifth live in a mere 58 counties. * The population and electoral shares, for whatever counties are selected, show in the boxes at right. (You'll need to select the "all" button below if you want to see every county at once). There is, of course, a lot going on here, including a long history of regional and metropolitan patterns in partisan alignment. But a hopeful reading of the map would go something like this: People who live close to one another are more likely to know someone of a different color, a different income group, or a different sexual orientation. They therefore rely upon and appreciate the provision of public goods and public services (transit, parks, garbage collection), even as they consume fewer public dollars than their less-densely populated counterparts. * Correction: An earlier version of this post misstated the number of counties.